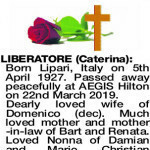 The Funeral Mass for Mrs Caterina Liberatore of AEGIS Hilton, formerly of White Gum Valley will be celebrated in Christ the King Catholic Church, Lefroy Road, Beaconsfield commencing at 10.15am on FRIDAY (29.03.2019). The Cortege will leave the Church at the conclusion of Mass and arrive at the main entrance of FREMANTLE Cemetery, Carrington Street, Palmyra at 11.30am for an Entombment Service. Please assemble at Samson Pavilion at 11.20am. Vigil Prayers and Rosary will be recited in Christ the King Church, Beaconsfield at 9.45am prior to Mass. No flowers by request, donations in lieu to Alzheimer's WA. Born Lipari, Italy on 5th April 1927. Passed away peacefully at AEGIS Hilton on 22nd March 2019. Dearly loved wife of Domenico (dec). 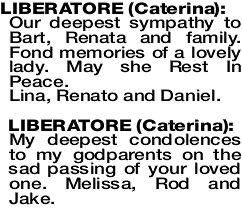 Much loved mother and mother -in-law of Bart and Renata. 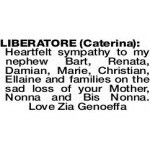 Loved Nonna of Damian and Marie, Christian and Ellaine. Cherished Bis Nonna of Nicholas, Isabella, Alessandra and Jude. For your sweet and gracious nature, for your understanding way, for the patience and the thoughtfulness you shared from day to day. 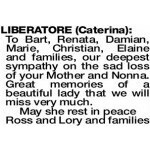 For all the many helpful things you found time to do for us, thank you, Mum and Nonna, may you rest eternally. Our sincere thanks to Dr Monaco and all the staff at AEGIS Hilton for their wonderful care. 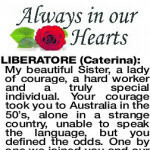 LIBERATORE CATERINA My beautiful Sister, a lady of courage, a hard worker and a truly special individual. Your courage took you to Australia in the 50's, alone in a strange country, unable to speak the language, but you defined the odds. One by one we joined you and our family was reunited. Over the years we shared some precious memories but who was to know that adversity would play such a big part in your later years. It was a privilege to be your sister and to share those final days with you. Although I'm alone with a heavy heart I'll find comfort knowing that you are at peace with our loved ones. Love you Genoeffa. 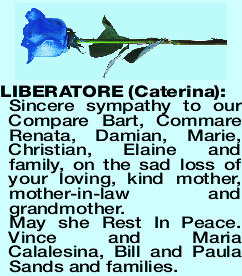 LIBERATORE CATERINA Sincere sympathy to our Compare Bart, Commare Renata, Damian, Marie, Christian, Elaine and family, on the sad loss of your loving, kind mother, mother-in-law and grandmother. May she Rest In Peace. Vince and Maria Calalesina, Bill and Paula Sands and families. 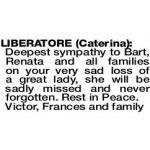 Deepest sympathy to Bart, Renata and all families on your very sad loss of a great lady, she will be sadly missed and never forgotten. Rest in Peace. 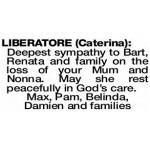 LIBERATORE CATERINA Heartfelt sympathy to my nephew Bart, Renata and family on the loss of your Mum, Nonna and Bis Nonna. Together again with her loved ones. To our cousins Bart, Renata and family, our deepest sympathy on the loss of your mother. Zia you will always be in our hearts. 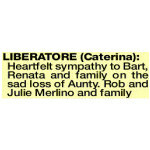 To our beautiful Aunty Caterina, you will always be in our hearts. 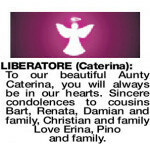 Sincere condolences to cousins Bart, Renata, Damian and family, Christian and family Love Erina, Pino and family. 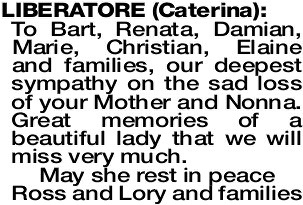 To Bart, Renata, Damian, Marie, Christian, Elaine and families, our deepest sympathy on the sad loss of your Mother and Nonna. Great memories of a beautiful lady that we will miss very much. 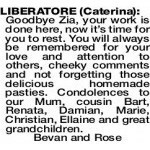 LIBERATORE CATERINA Goodbye Zia, your work is done here, now it's time for you to rest. 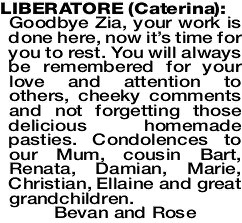 You will always be remembered for your love and attention to others, cheeky comments and not forgetting those delicious homemade pasties. 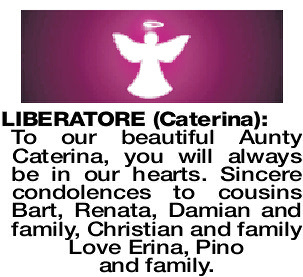 Condolences to our Mum, cousin Bart, Renata, Damian, Marie, Christian, Ellaine and great grandchildren. 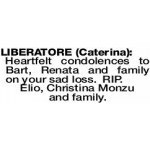 Heartfelt condolences to Bart, Renata and family on your sad loss. RIP. Elio, Christina Monzu and family. 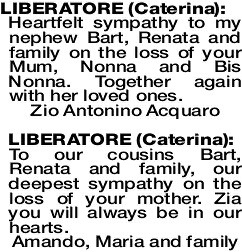 Deepest sympathy to Bart, Renata and family on the loss of your Mum and Nonna. May she rest peacefully in God's care. 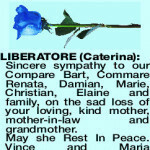 LIBERATORE CATERINA Our deepest sympathy to Bart, Renata and family. Fond memories of a lovely lady. May she Rest In Peace. 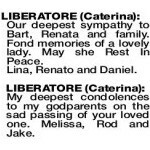 My deepest condolences to my godparents on the sad passing of your loved one. Melissa, Rod and Jake.